The University of Brighton Design Archives is a member of the Arts Council-supported Subject Specialist Network for Posters. Archivist, Sue Breakell took part in a Posters Forum held at the V&A in May 2012 and Curatorial Director, Catherine Moriarty spoke at the conference Posters: Creation, Collection and Context, held at the V&A on 1 March 2013, and again in December 2016 at the conference Posters: New Research, New Perspectives. The poster subject specialist network aims to promote knowledge exchange within and beyond the museum, archive and library community. The underpinning ambition is to realise the potential for a higher volume and quality of public engagement by developing the networks for information exchange and project collaboration. In January 2017 Catherine Moriarty was invited by Kyoto Institute of Technology to take part in the symposium Graphic Design Archives: Today and looking Forward. Part of a project for the Japanese Agency of Cultural Affairs, this initiative also focuses on the importance of subject specialist design networks. Click here to read an account of this visit. The University of Brighton Design Archives holds several thousand posters among its collections and their care and stewardship present particular challenges and opportunities. The following list was prepared by Sue Breakell in 2012. The Brighton School of Art was established above the kitchen of the Royal Pavilion in January 1859, moving to its own building in Grand Parade in 1877. Achieving national standing and expanding substantially in subsequent decades, the school moved into larger modern premises on the same site in 1961. In 1970 Brighton Polytechnic was formed from the Brighton Colleges of Art and Technology. In 1992 along with many other former Polytechnics, Brighton was formally designated as a 'new' university - the University of Brighton. The archive includes a small group of posters relating to exhibitions organized and held at the University of Brighton Gallery, including staff and student work as well as major loan exhibitions, and posters for student open days. The Design Council was founded in 1944, and originally called the Council of Industrial Design (CoID). It owed its origins to the wish of the UK government's Board of Trade to see British manufacturers increase their performance as exporters of goods. It was believed that competition in world markets would be fiercer than ever in the post-war period, and progress made by other nations towards greater sophistication in their product design needed to be equalled by industrialists at home. At the same time, British retailers, educators and the buying public were considered to be important audiences for the Council’s message. In the wake of the Council’s foundation similar bodies were established in many other countries. The Design Centre for British Industries was opened in Haymarket, London on 26 April 1956, as a shop window for the Council of Industrial Design to promote its activities in support of British industry. The building in Haymarket became the Council’s new home. A vibrant programme of exhibitions took place in the display space downstairs, while in the offices above plans were made for exhibitions around the country and overseas. 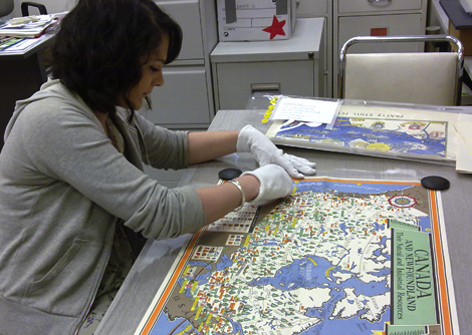 The archive includes over 200 posters used to promote these activities. Margaret Howell showcased 12 of these posters in her 2017 calendar. Edwin Embleton is best known for his work as Studio Manager in the Publications Division of the Ministry of Information during the Second World War. Born in 1907, he studied at Hornsey School of Art. He began work at Odhams Press in 1924, first as a layout and lettering artist and later becoming Studio Manager. At the outbreak of the Second World War, he was seconded to the Ministry of Information where he became Art Director and Studio Manager, in charge of print and publications for the Ministry, from commission and design to production. By the end of the war, the office comprised dozens of staff, in addition to the artists and designers who were commissioned. They produced an extraordinary range of high quality and effective material, which played an important part in Britain’s war effort at home and abroad. After the war, Embleton returned to Odhams Press, and was awarded an MBE for his war service. The archive comprises a selection of Ministry of information (MOI) printed propaganda from 1939-45, including a small number of posters. The International Council of Graphic Design Associations (ICOGRADA) has been the professional world body for graphic design and visual communication since it was founded in London in 1963 with Willy M de Majo as its first President. A voluntary grouping of more than 70 independent associations from 45 countries, it has a strong educational remit and promotes the role of graphic design in both society and commerce. The archive includes over 1500 posters, many of them submitted by member countries and covering a range of subjects including cultural events and social campaigns, as well as a large group relating to ICOGRADA’s own activities. The International Council of Societies of Industrial Design (ICSID) was founded in London in 1957 with the aim of promoting the status of industrial designers, raising the standard of industrial design through training and education, and encouraging cooperation between industrial designers around the world. By the end of the 1960s ICSID included over 40 member societies from more than 30 countries. 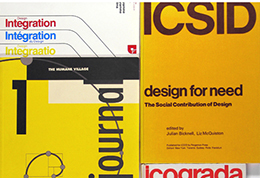 The ICSID archive documents the initiatives, ambitions and influence of this international organization that continues to make a major contribution to the representation of industrial design and designers across political boundaries and economic disparities. Hans Arnold Rothholz was born in Dresden in 1919 and emigrated to England as a boy. He designed posters for various clients, among them the Royal Society for the Prevention of Accidents (RoSPA) and the Post Office. In the late 1940s he designed promotional material for Wembley Stadium including the Olympic Games of 1948. In 1951 he was commissioned to work on the Land Travelling Exhibition for the Festival of Britain. Other clients from this time include airlines BEA and BOAC, the tea company Perera, and the shoe company Splendida. A keen Scout, Rothholz designed the programme for the World Scout Jamboree when it was held in Britain in 1957. 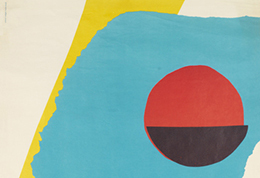 He designed murals and graphic schemes for the Bacon & Egg restaurants and the Grill & Cheese chain. Throughout the 1960s he re-branded Winsor & Newton art materials and towards the end of this decade, he created a new corporate identity for Wellcome to include pharmaceutical packaging, stationery and vehicle liveries. The archive includes 51 posters, dating from 1940-1960. They primarily comprise work for General Post Office/Post Office Savings Bank and the Royal Society for the Prevention of Accidents (RoSPA), with smaller groups for Winsor & Newton artists’ materials, Ealing Studios and others.